Have you ever wondered whether your cat has the same religious affiliations you do? 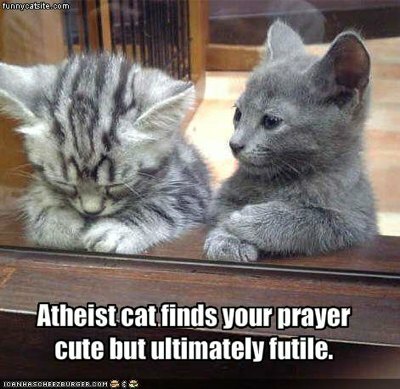 Have you ever wondered whether cats believe in God? Or whether they have an concept of the afterlife? Well so have we! That’s why we’ve trawled through the relevant literature and found ten perfect questions that will allow you to ascertain whether you need to organise a conversion party for your cat. d) knock stuff over, then walk away. d) my cat refuses to use the litter box. d) after it’s just viciously scratched your face/couch/child. d) will be friendly enough to get close, and will then hiss, scratch and spit. d) on me somewhere, this often involves claws. d) get up and start licking your face. d) your favourite knitted top. d) the cat chose me, I don’t know who it belongs to, but it won’t leave. d) try to bat the phone out of your hand/doesn’t appear to show up on camera. Mostly As: Your cat is Catholic! With that much guilt and ceremony it couldn’t be anything else. It’s favourite things would definitely include incense, gold leaf, indecipherable manuscripts, and monetary tributes. Can also have a tendency to rebel, so keep an eye on them. Mostly Bs: Your cat is an Atheist! A curious mixture of good-natured and selfish, this cat knows how it should behave, but sometimes doesn’t because, well, what are the repercussions? I mean really, all they have is the now, so y’know, YOLO. Mostly Cs: Your cat is Anglican! While less superstitious than the Catholic cat, this cat still has some strong beliefs and will always try to stand on proper polite behaviour. These guys are pretty low maintenance and will usually behave themselves. Mostly Ds: I’m pretty sure your cat is possessed. Either that, or it’s the embodiment of evil itself. Or it’s just a cat. Who knows right? Disclaimer: This quiz was written based on my completely negligible research. It’s entirely possible your cat might be neither a Christian nor an Atheist, but I’m not qualified to diagnose that. Further analysis of the cat’s behaviour should be undertaken by an expert. This quiz was in response to day twelve of the Writing101 course, inspired by an overheard conversation.